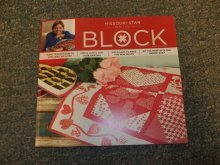 The Block magazine has arrived! It is awesome. If you are on our list, we have one put back for you. If you would like us to hold one for you, just send us an e-mail or give us a jingle at 815-879-3739. Do you have your calendars marked for the Covered Bridge Quilters Guild Quilt Show on Saturday, March 21 from 9 - 5 and Sunday, March 22 from 11 - 4 at the Bureau County Fairgrounds in Princeton, IL? It is going to be a wonderful show!